My great-grandfather, Marion Lumpkins, outlived all five of his full-siblings and even one of his daughters. He passed away in 1998 at the age of 91. When you consider the times in which he lived, it seems fortunate that he reached such a ripe old age. 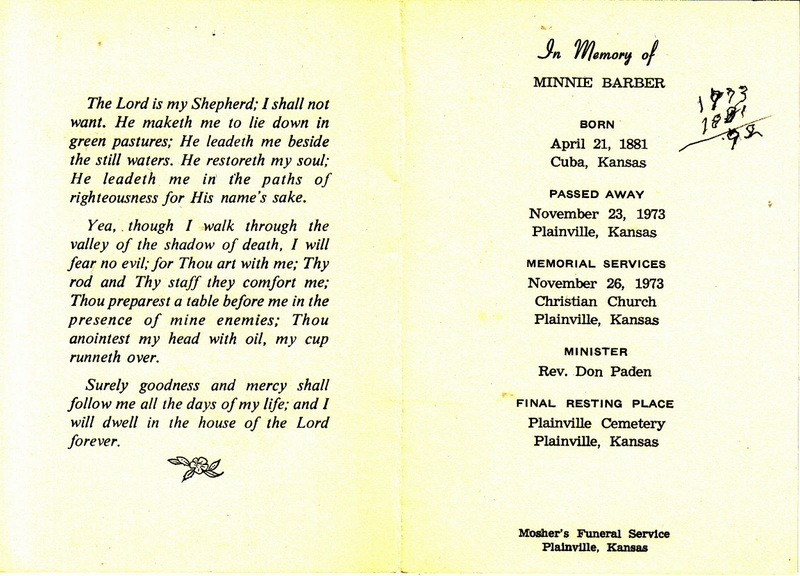 Born in January 1907 in the town of Rossville, Kansas, he grew up in an era when child mortality was high. He lost a two-year-old brother to whooping cough and a five-year-old sister to dysentery. 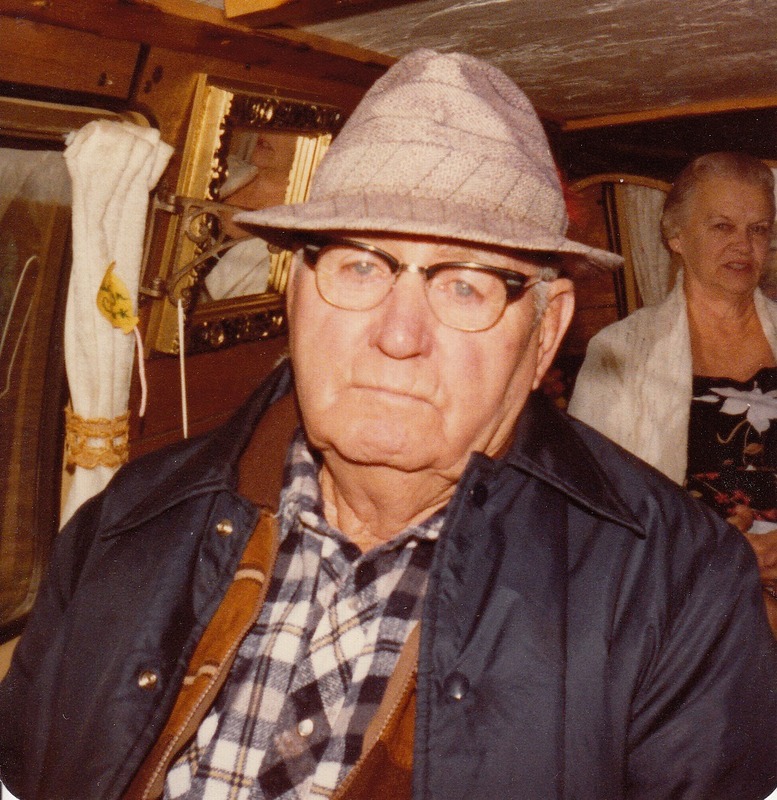 As a farmer during the Great Depression and the Dust Bowl, he lived a physically demanding life. His work had him in the fields from dawn to dusk. Despite it all, he boasted good health and a laid back demeanor. As the years passed and his family started to pre-decease him, he quietly began marking time. 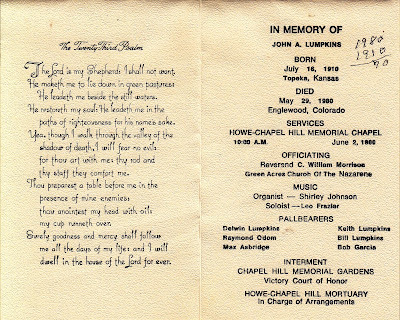 He saved the funeral cards that were distributed at the memorial services for his family. As I reviewed the cards, I noticed his handwriting on three of them. 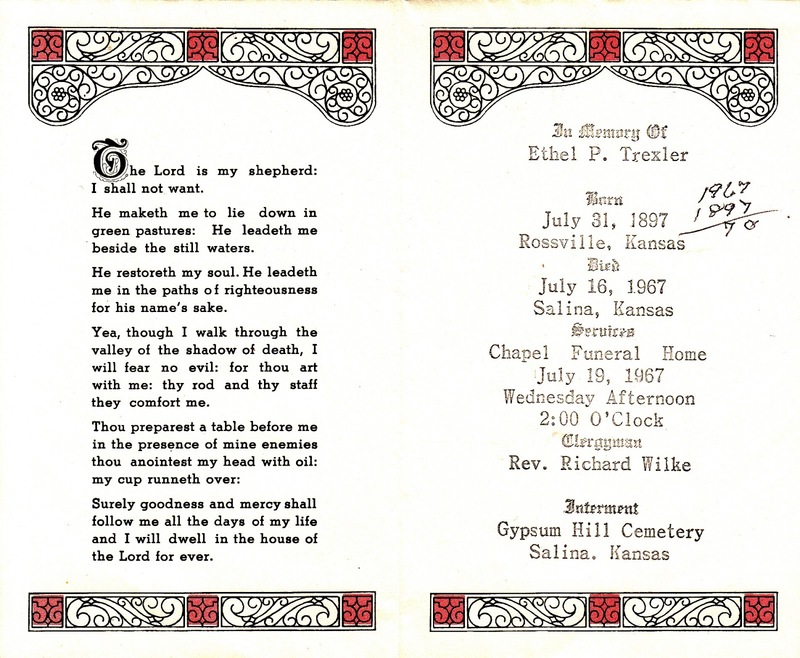 The first was for his elder sister Ethel (Lumpkins) Trexler, who passed away in 1967. In his small and shaky script I saw where he had manually done the math to determine her age at death. 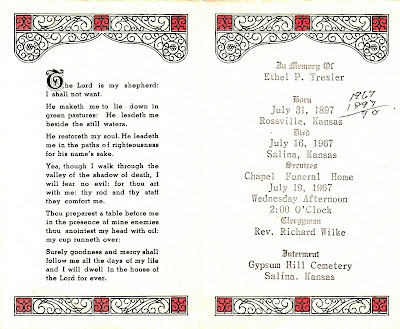 Subtracting her birth year from her death year, he reached the conclusion that Ethel lived to be 70 years old. 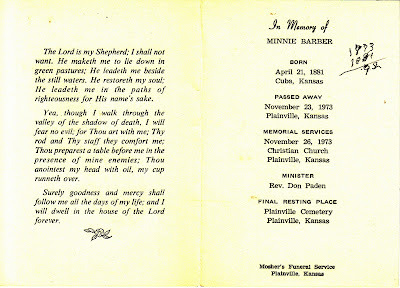 The second funeral card was for his mother Minnie (Hawks) Lumpkins Barber, who passed away in 1973. Again, his shaky penmanship crunches the numbers and determines that she lived to be 92. If he was concerned about his own longevity, was that number a relief to him? 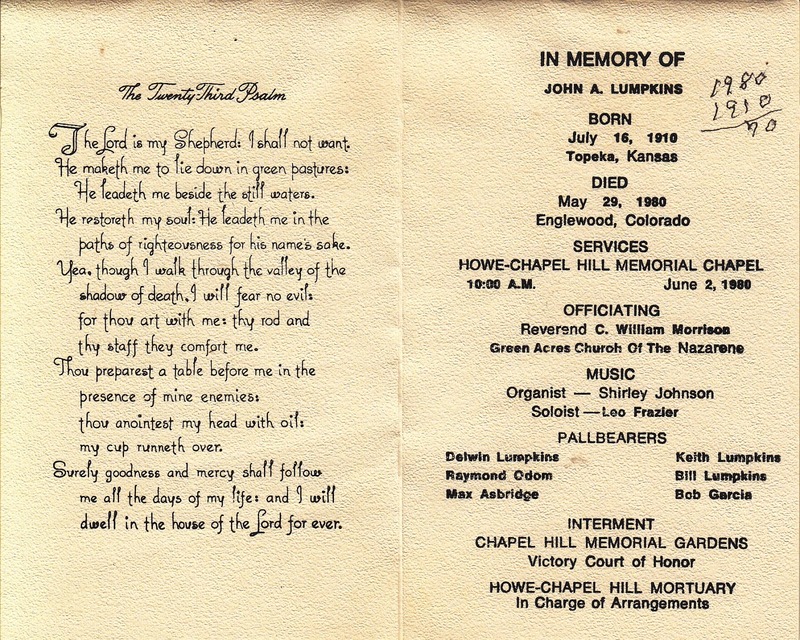 The last memorial card was for his younger brother John Andrew Lumpkins, who passed away in 1980. His calculations determined that John lived to be 70 years old - the same age as his sister Ethel. He had another full-sibling - a brother named Irwin Roy Lumpkins - who died in 1988 at the age of 83. I didn't find a funeral card for him in my grandfather's belongings. What did this exercise mean to Marion? His father was only 38 when he passed away following an accidental head injury. Perhaps he was trying to determine his life expectancy based on family history? His two siblings suggested that anything beyond 70 was doing pretty darn good, and, ultimately, he lived to nearly the same age as his mother. Not bad for a 20th century farmer. What an interesting piece. Several of the old photographs I have in my possession have scribbles like this. I had not thought about other reasons for their being there. Nice title, too. I'm not sure I would have come to the same conclusion (that he was marking time) if all the funeral cards weren't stored together. Would the context have dawned on me if they were separate? I'm not so sure. Interesting cards and post. 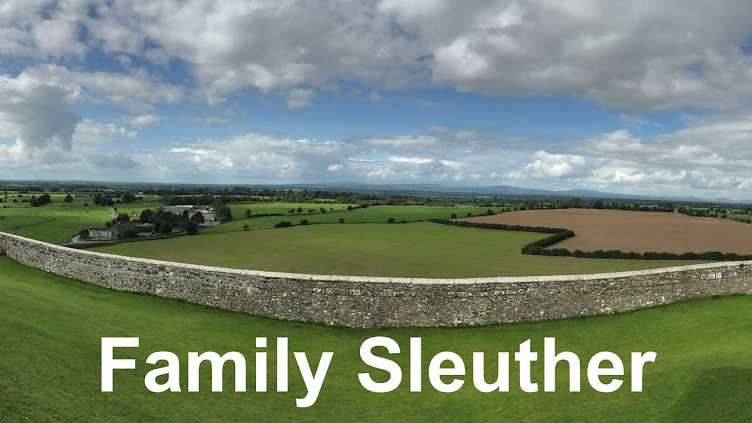 It's a bit odd to me that he had to do the math to figure out their ages, but maybe when you come from a large family, it's hard to keep track! I think family size is a possible explanation or maybe even his own age. I suspect he crunched the numbers later in his life - well after his siblings' passings - and may have not remembered. Ah, that makes sense. He wasn't doing at the time they died, but rather later all at once. Thanks!